For quick and precise sawing of branches up to 80mm in diameter. 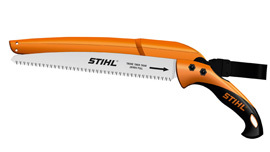 The new range of MEGACUT pruning saws is designed for both professionals and frequent users at home. the 3 sided Japanese blade integrates hardened, chrome-plated steel teeth for fast and precise cutting. Available in Small (240mm) or Large (330m) version.